ACO Mold is injection molding company located in Shenzhen China. We provide one-stop injection molding mold making service. We have more than 10 years experience in plastic manufacturing industry. 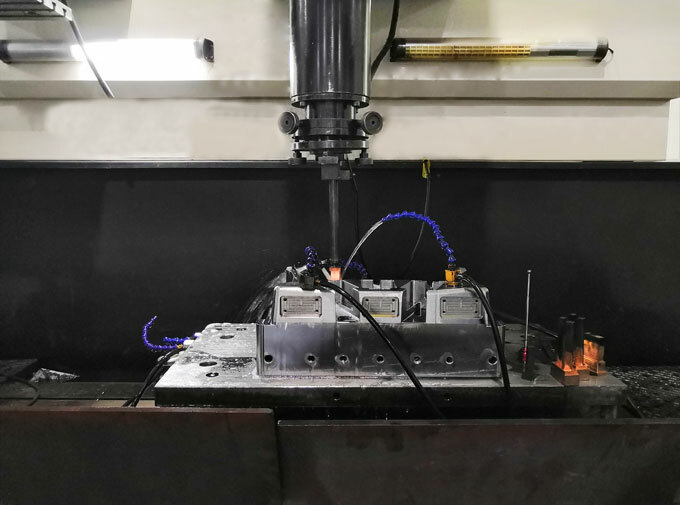 In order to provide high-quality injection mold, we equipped advanced a series of equipment such as CNC machining center, engraving machine, spark machine, wire cutting, grinding machine, milling machine, drilling machine and lathe etc. Below is something you need to know about ACO Mold injection molding mold making. Steel material needs to be very pure to obtain a highly finished processed surface. Therefore, less inclusions, less segregation, dense structure and high surface hardness are required. The surface should be wear-resistant and resistive, and it is required to have a certain surface hardening layer. Generally, it should be above 45hrc, and the surface finish should remain unchanged for a long time. It has sufficient strength and toughness to withstand the load without deformation or damage. Heat treatment deformation is small to ensure interchangeability and matching accuracy. It has good electrical processing capabilities. Swedish 8407, US S136 and 420&H13, 2316&2344 and 083 of Europe, LKM2316, LKM738H, 1.2083, 1.2312, 1.1730, H13, P20, MOLDMAX-HH. In the production of various industrial products, the mold application is to ensure the product quality, increase its productivity and reduce costs. Therefore, in addition to the reasonable mold design, the selection of reasonable mold structure, the high-requirements injection mold manufacturing technology is also needed. In order to produce qualified products and play the role of injection mold tooling, the mold design and mold making must have high precision. The mold accuracy is mainly determined by the accuracy requirements of plastic parts and the mold structure. In order to ensure the accuracy and quality of the injection molded parts, the precision of the mold working part is usually 2 to 4 higher than that of the injection molded parts. The mold structure has relatively requirements for the cooperation between the upper and lower molds, and the mold components must have sufficient manufacturing precision, otherwise the mold will not be able to produce qualified products, and even the mold cannot be used normally. Plastic injection mold tooling is relatively expensive process equipment. The plastic mold costs account for about 10% to 30% of the overall cost, and its service life will directly affect the injection mold making costs. Therefore, in addition to special cases such as low volume injection molding and new product trial production etc, the mold generally requires a long service life. In the case of large volume injection molding, the mold service life is especially important. Injection mold making cycle is mainly determined by the level of manufacturing technology and production management. In order to meet the production needs and improve the products competitiveness, it is necessary to shorten the injection mold making cycle as much as possible under the premise of ensuring quality. Plastic mold cost is related to the complexity of mold structure, the mold material, the mold manufacturing precision requirements, and the processing method. Engineers of injection molding company must reasonably design mold and formulate mold processing process according to the requirements of injection molded parts, and strive to reduce plastic mold manufacturing cost. The above 4 requirements for mold making are interrelated and mutually influential. Unilateral pursuit of mold accuracy and service life will inevitably lead to an increase in mold manufacturing costs. It is also not advisable to only reduce the cost and shorten the mold manufacturing cycle while ignoring the mold accuracy and service life. Therefore, when designing and manufacturing the mold, it should be comprehensively considered according to the actual situation, that is, under the premise of ensuring the quality of injection molded parts, the mold structure and manufacturing method suitable for the production amount of the product should be selected to minimize the plastic mold cost. For high-precision mold, it need to use high-precision CNC machine tools to process, and the mold material and mold machining process have strict requirements, and CAD / CAE / CAM are also needed to design and analysis. However, if some injection molded parts have specially requirements, the advanced hot runner injection molding, gas-assisted molding, and nitrogen cylinders are also needed. Injection molding companies should equipped with copy milling equipment such as CNC, wire cutting machine, EDM and CNC, followed by high-precision grinding machine, high-precision three-coordinate measuring instrument, computer software and related design tools. Generally, large-scale precision stamping dies (such as automobile cover parts molds) should consider whether the machine tool has a crimping mechanism, or even a lubricant, multi-station grade. In addition to punching tonnage, it is necessary to consider the punching, feeding device, machine tool and mold protection device. Above injection mold manufacturing methods and processes are not available and mastered by every injection molding suppliers. It is necessary to know the processing capability when selecting cooperative injection molding manufacturer, it includes not only hardware equipment, but also the management level, processing experience and technical strength of molding company. For the same set of molds, the quotations from different injection molding manufacturers are different. Customers must customize their plastic mold according to the actual situation, such as the requirements of plastic products. Not the expensive injection mold will be the best, so is the cheap mold. Qualified mold after mold trial may not be able to produce a batch of qualified products. It is mainly related to the processing machine selection of mold parts, molding process, temperature, time and the skill level of the operator. With good molds, there must be good molding methods to process. It is best to provide one stop service of mold making & injection molding & product assembly to avoid long-term collaboration.